Simply spray and wipe with a soft cloth. Note: A minimum quantity of 228 must be ordered, and in units of 12 thereafter. 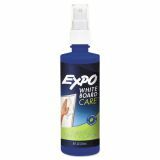 EXPO Dry Erase Surface Cleaner, 8oz Spray Bottle - Expo Cleaning Spray cleans and refreshes whiteboards. Nontoxic cleaner is perfect for classrooms and conference rooms. Certified AP nontoxic formula conforms to ASTM D4263.